Ok, I'm a day late and now four dollars short(er), but I hereby declare summer officially started! Woohoo! Can't believe it took me till June to have my first scoop of fresh ice cream! and boy was it fresh, it was still soft in fact (I almost lost my ice cream actually). 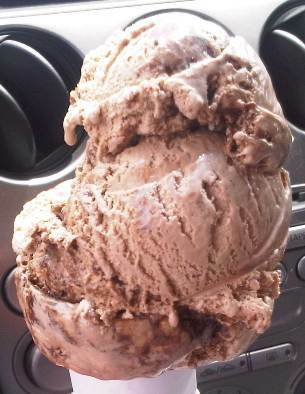 I hit up Pinecroft Dairy to try some of their Brownie Batter ice cream today. I think if you are going to call something brownie batter that technically the swirl should actually be brownie batter (of some sorts). Well, it may have had a little texture, maybe like chocolate syrup mixed with flour or something, but it wasn't true batter. It did have some nice small brownie chunks in it, though ofcourse, I could always use a few more. My only real regret is not getting a larger size (it was good, it just wasn't a heavy ice cream that weighed me down). Ok, i'll stop talking in ( )s now. Don't forget to celebrate the start of summer with your favorite place this week! Bring the coworkers, the kids, whoever will come with you! Scoop On!